Hello, Don Milne here, your ROADTRIP-'62 ™ traveler ready to hit the road again. This is the first of our ROADTRIP-'62 ™ routes, and we are traveling US-23. In 1962 it ran from Mackinaw City, MI to Jacksonville, FL., and it still runs between these cities, 1444 miles today. We're at Bay City, Michigan, three days down the road from the northern beginning point at Mackinaw City. For the next several days we will be criss-crossing freeways, as many parts of US-23 were already freeways by 1962. However, because the freeways are within 5 miles of the old road, we'll still take the old road. There were no services along the freeways yet in 1962 anyway, so traveling brand new freeways would not show us much of the country. As we continue along this virtual roadtrip, if you see anything you like, get out on the road and enjoy it in person. This type of travel may be fun, but there's nothing like the real thing! And, at any time, click on an underlined word below to learn more about the places on the trip. Ready? Set? Let's buckle up again and go! We start out the day traveling along the Saginaw River, where old US-23 is now numbered as M-13. If you didn't get an opportunity to see the lake freighters when we had a view of Lake Huron, here's your last chance. They travel up and down the Saginaw River, just a couple hundred feet away from your car! Great viewing for the boat lovers, and it really looks odd too, like the river is too small to hold such large ships. There are several docks in the Saginaw area and the river has been dredged to fit the ships since the St. Lawrence Seaway was opened in 1959. A good spot for watching is Veterans Memorial Park, a former roadside park at the Saginaw County line. Veterans Memorial Park is a 1-1/2-mile parkway along the Saginaw River, with picnic areas, fishing and boat launch access. The park used to have an interesting log building, constructed from logs dredged out of the river! But it was sold and moved away in 2006. Arriving in Saginaw, Michigan, we come to the largest city so far on our route. It's currently about 58,000 population in a metro area of about 200,000 but in 1962 it was over 90,000 in a metro area of about 140,000. Being a larger area, it has more to do than the places we've been. We can choose from the Saginaw County Historical Museum (also called the Castle Museum), the Saginaw Art Museum, or the Saginaw Children's Zoo; all old enough to have been here in 1962. Let's try best 2 out of 3: the Historical Museum and the Zoo. The Art Museum that I'm not stopping at is a rather small building, even with recent additions. It was opened in 1948, originally providing exhibits of art, music, history and natural history. When the Historical Society of Saginaw established the Castle Museum, the Saginaw Museum sent their historical items to them and has since been called the Saginaw Art Museum. The Castle Museum is housed in the former main Post Office, and that's what was in the building in 1962. That same year, a Historical Society was formed to create a museum in Saginaw, but their first museum was in another building. Meanwhile, this remarkable Post Office had been scheduled for demolition several times but was saved by action led by the Historical Society, and in the 1970's they placed it on the National Register of Historical Places. The County purchased the site and here we are. Today's historical exhibits are a plus, but both the exterior and interior were well worth looking at in 1962 anyway. This unusual French chateau style post office opened in 1898 and has a personal memory for me, as this is where I bought my first postage stamps as a six-year old stamp collector. Come to think of it, stamp collecting was much more popular then than it is now. Nearly any magazine had ads for philatelic companies, often sending over 100 stamps for 10 cents. Popsicles even had offers on the wrappers for free packs of stamps if you sent in enough used wrappers! You can find hobby stores selling collectable cards today, such as sports cards or gaming cards, but in 1962 most hobby stores sold stamps instead. And, not just the stamps: they sold all kinds of supplies for collecting stamps, including the albums to put them in and catalogs to tell you what stamps were available in the world. One of the most exciting philatelic events of 1962 was the error in printing one sheet of the United States stamp commemorating U.N. Secretary General Dag Hammarskjold, Printing errors had always made for a rare, and therefore high-priced stamp. But the U.S. Post Office changed that forever when they purposefully reprinted 40 million stamps with the error, destroying the value of the error and giving everyone a chance to own one. I still have mine! I also have more of my collection and other info on the Stamps of 1962 on another page. The Saginaw Children's Zoo is off of US-23, straight south on Washington Av. It has been completely remodeled, and about the only thing still in place from 1962 is the old monkey cage, now used as a butterfly exhibit. Even the pond in the center of the zoo has been reconstructed from its old simple concrete duck pond days. The entire zoo is much more interesting than it was back then. An extra bonus is across the street: the Saginaw Waterworks. This splendid gothic building houses the pumps and filters for the water that comes from Whitestone Point, that we passed back on the Lake Huron shore. Tours are provided of the filter gallery and worth the time, as you get to see how water treatment works. The beautiful building is even more so in the Christmas season, as it is profusely decorated with lights outdoors. After seeing the sights, we head back downtown to a little restaurant on Franklin St., the Savoy Bar & Grill. It is one of the few eateries left from earlier times, and it recreates the little hole-in-the-wall restaurants of busy downtowns. Try one of the old fashioned menu items for lunch; maybe Val's Hot Beef Sandwich, which is a roast beef sandwich with gravy on the meat and potatoes and coleslaw on the side. And all served behind a beautiful, working, antique neon sign outside! After lunch, we leave town on what was Business US-23, E. Genesee Av., passing the second automobile plant today. This plant still makes parts: the first one we saw still casts metal. However, we also passed the locations of two demolished plants. One was a Nodular Iron Casting Plant, built to cast a type of iron first poured in 1962, right here in Saginaw. The other missing plant was a Chevrolet parts plant, so it is quite possible that parts of our 1962 Chevy Impala were built here in Saginaw. And if not here, perhaps parts came from Flint, Michigan, which we will pass as we head south, closer to Detroit...Motown. Saginaw has a little Motown music connection: Stevie Wonder was born there! His debut performance at age 12 at the Apollo Theater in New York, and his debut album, were both in 1962. So let's listen to a little Motown music on the radio as we drive, to commemorate the city and its great sound. A little Stevie Wonder is always good, and "Fingertips" is always great! Speaking of Flint, from Saginaw to Flint US-23 used to run with US-10 on the same road, so this ROADTRIP-'62 ™ will overlap with that one. I think that when I get to that trip, I'll travel the other direction just so we can see the road both ways. Route US-10 used to run from Seattle, Washington to Detroit, Michigan. It is one of only two US routes to incorporate a ferry crossing, the other being highway US-9, which our US-6 roadtrip crosses. Today, US-10 is chopped short on both ends. The west end begins at West Fargo, North Dakota and the east end never makes it even as far as Saginaw, ending at an I-75 freeway interchange back in Bay City. Just south of town, as US-23 becomes the Dixie Highway, is the site of the former Auto Drive-In. We will be fortunate to be able to see a movie tonight at another drive-in, though this one is gone. Let's stop to buy gas in Bridgeport, at Gobeyn's on the point. Though the brand of gasoline has changed, the station has been here long before 1962. And it still offers repair service and towing, unlike most gas stations today that are only gas and convenience stores. Well, off we go and cross the freeway again leaving Bridgeport. It was here in 1962, and was one of the first freeways I remember as a kid. We'll still stick to old US-23 as the next stop is on that road. Besides, I proposed to my wife of 39 years on this stretch of US-23. We were in the back seat of a Volkswagen mini-bus, with my dad driving us home from the prom. So there's my romantic story of US-23. The road is named Dixie Highway here because it went south, to Dixie. The original Dixie Highway was actually a chain of highways pieced together in the 1920s from north to south, in the days before the numbered US-highways. Organizations such as AAA helped designate and sign the named highways before state governments began numbering them. If we were doing a Roadtrip-'25 TM, we might use the Dixie Highway instead of US-numbered routes. Parts of the route used US-23, so as a matter of fact, we are using some of the Dixie Highway. Back in Mackinaw City, where we began, there was once a Dixie Highway Memorial, but I have not been able to find where it used to be located, or whether it was still there in 1962. Our last points of interest before Flint are near Birch Run, Michigan. No, it's not the mega outlet mall that was built in the 1980s. We'll make a short stop at the Dixie Auto Speedway just to look it over. They've been racing stock cars on the oval for over 60 years, and if we were staying overnight it would be a great spot for some entertainment. The smell of the fumes and roar of the crowd! There's another track, Auto City Speedway, just up the road in Mt. Morris, Michigan also. Don't worry though: we'll see some races another day. Speaking of fumes, in Birch Run there is at least one spot in an oil well field where the natural gas is burned off with a 24/7 flame. Few people associate Michigan with oil wells, but since 1925, when Michigan's first oil field was discovered in Saginaw, there have been wells all around the Saginaw valley. We passed some yesterday up by Kawkawlin and you may have seen a flame there too. By the turn of the twenty-first century, oil and gas production had occurred in 63 counties and had produced one-fifth of the petroleum energy used in Michigan. Strangely, the flame in Birch Run is adjacent to that mega outlet mall I mentioned. Heading south to Flint, the 4-lane road is strangely empty, and it's been that way ever since the freeway was completed. You can spot many businesses that once enjoyed more traffic, and therefore more business. There was even a small amusement park just off US-23 near Birch Run, Michigan called Pine Ridge (though I remember it as Pine Run; perhaps it changed names). One odd piece of memorabilia is an old truck scale on the west side of the road, where Clio Rd. crosses. It's hard to see, but it's here because this was once the main north-south truck route in this part of the state. The scale house is gone now, replaced by a Weigh Station on the freeway. I'm going to take advantage of Flint, Michigan's Cultural Center, and take in an early show at the Robert T. Longway Planetarium. The Longway Planetarium was dedicated in 1958, so we could have visited in 1962. Featuring 285 seats under an impressive 60-foot dome, it is still Michigan's largest planetarium. Of course, besides the traditional star shows they now host laser shows set to rock music. Pink Floyd is one of the more popular shows. There are afternoon star shows on Saturdays and Sundays, and laser shows in the evenings. Let's say we're here on a Saturday and see a matinee show. Or, if art is more your style, you can visit the Flint Institute of Arts. It's right next door to the planetarium, and features both permanent and traveling exhibits. It was founded in 1928 and moved into its current location in 1958. For a city the size of Flint, it boasts a broad collection, including a sculpture garden, modern art, and 17th century tapestries among its 6,500 objects. And also in the Cultural Center is the Alfred P. Sloan Museum. Its Pierson Automotive Gallery has a collection of over 80 Flint-built automobiles. Even if there's not a 1962 model, there's sure to be some we would have seen on the road in that year. And if you came for information on your personal 1962 Buick, they house a collection of Buick engineering papers, service manuals and sales literature for the car restorer. Flint was the original home of the General Motors Corporation, now headquartered in nearby Detroit. The company was founded here in 1908 by William C. Durant and once housed over a dozen auto plants including Buick Division, AC Spark Plug, Chevrolet Division, Fisher Body, and others. Today it's hard to find an auto plant in Flint, as many closed beginning in the 1980s and have since been demolished. One complex was so large it was called Buick City, but it's gone too. It covered nearly 1000 acres and they were still building new assembly lines in 1960! The last car rolled off the assembly line on June 29, 1999. In the 1930s the city was also the birthplace of the United Auto Workers union, during a sometimes violent strike. Today, the closest auto plants to US-23 are the Flint Metal Center, just west on W. Bristol Road, and the Flint Engine South, also on Bristol Road. The Engine plant is too new for us but the Flint Metal Center has been there since 1954, so you can drive by and see where parts of a Chevrolet like ours were made in 1962. After the planetarium show and museum, dinner is at the downtown location of Flint's own fast-food restaurant: Halo Burger. The chain was founded over 80 years ago. It was bought from the original owner by Bill Thomas, and no, I don't think he was related to Wendy's founder Dave Thomas. Maybe good burgers just go with the name? 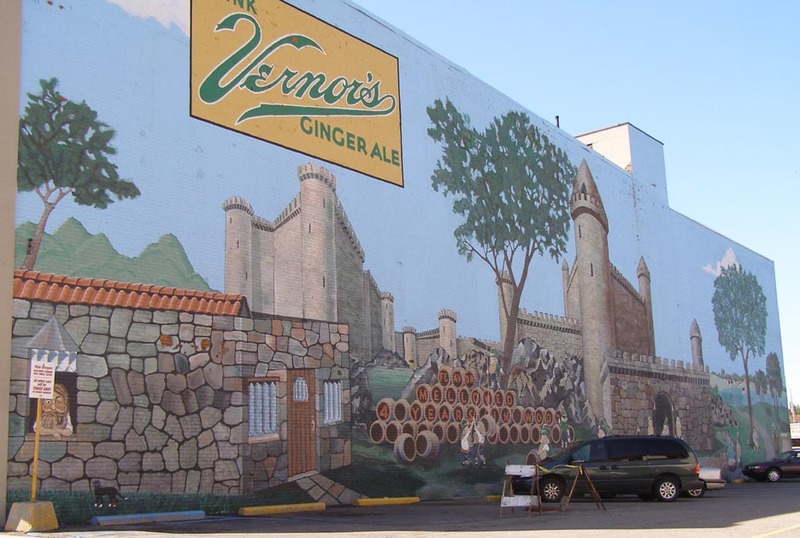 Anyway, even the location is unique, as the building adjacent to the parking lot is painted with a great mural featuring Vernor's Ginger Ale and the dwarves or gnomes it used to have as trademarks. Bill bought his building in 1951, for his second restaurant, and later helped pay to restore the Vernor's mural. He then renamed the business Halo Burger in 1958, to avoid paying franchise fees to the owner of the previous name: Kewpee Burger. Halo Burger has often been voted Flint's best burger and remains a favorite in a city that otherwise seems to enjoy its coney dogs more than burgers. (There are coney island named restaurants all over this place!) Get the biggest burger you can eat and a Boston Cooler shake: you won't be dissapointed. One of the more unusual things you'll find in Flint is a brick street. Right in front of Halo Burger, and for several blocks downtown, US-23 is paved in red bricks laid in 1936. This is actually the second brick pavement here, and before that it was paved with wood blocks! US-23 historically was not the main route south out of Flint. That honor went to US-10, which headed straight to Detroit, and the two routes separated here in downtown Flint. Therefore, most of the motels were out on US-10. I have found the buildings of several old ones on US-23, but none are open today and I would not want to stay in the neighborhoods they were located in now anyway. So, we will try to find an older motel near the freeway, perhaps near M-21, Miller Rd. (old M-78), or Bristol Rd. (old M-121). On the way, let's stop to buy comics. In 1962, we would have bought them at a drug store, as there were no comic shops. A couple of 1962 comic books will come in handy for later reading, on nights when the motel is boring. But tonight, we'll be out too late to get bored! Tonight, we're going to a drive-in. The US-23 Twin Drive-In (formerly the US-23 Highway Theatre, according to the neon sign) opened in 1951. The screen burned down in 1997 but it was re-opened with 2 screens. So now you have your choice of two movies every night. Don't forget to get a big tub of popcorn; you'll be up late!